The library’s computerized didactic database contains over 30,000 files (and the number is growing as each week teachers share their material with their colleagues), including lesson plans, instructions for arts and crafts projects, worksheets, tests, illustrated material and more, divided into subjects (including halacha, holidays, math, grammar, the weekly parshah, and more) and according to age levels. Hundreds of educators and educational institutions have shared their learning materials. Copyrights have been certified for ALL materials. Each week, Achiya’s Pedagogical Library sends over 7,000 emails (and that number, as well, continues to grow) to teachers throughout Israel and in 25 countries throughout the globe, containing relevant pedagogical material according to the teachers’ specific needs. 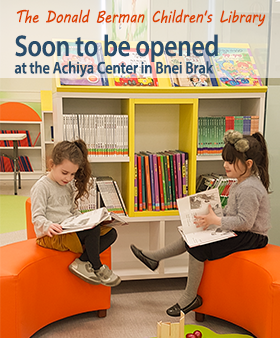 In September 2018 Achiya opened the Achiya Yeda website www.achiya.org (in Hebrew) which enables free entry and use for educators and parents in Israel and all over the world. As of today, March 2019, more than 15,000 individual users from 53 countries have browsed the website and 4,100 users are registered and download materials according to their needs. The project, brainstorm of Rabbi Chaim Rosenstein, former head librarian at the Achiya Pedagogical Library located at the Bnei Brak branch of the Teachers’ Training College, was created in response to the hundreds of phone calls, some from as far away as New York, China and Iran (!) requesting pertinent material to help the teachers create exciting lessons. We invite teachers, both in Israel and well as abroad, to participate in this special project. Register to our website or register to receive a weekly email! Send us your lesson plans, worksheets, and innovative ideas! Let’s help one another, for the sake of our children’s education!